Research reveals that many Christians seldom read their bible, and when they do, they fail to take time with it. Scripture itself encourages us to read on a regular basis and to meditate upon the Word. People often ask about how to read the Bible. There is no one answer, besides saying consistently and deeply. The Bible is to be studied and meditated upon. There are many tools available online and in book form that can be helpful. We recommend developing a systematic pattern of Scripture reading: ideally making a habit of daily reading. If you appreciate variety and believe you can commit to a daily reading plan then you could try this one, it is designed to give you a different genre each day. Or this Chronological Plan which is also a daily plan will help you read in the order the events took place. An example of a devotional pattern of reading is the WordLive, from Scripture Union. This is a free, online guide, helping you meet with God devotionally – through the Bible. Each day uses a new Bible passage with fresh resources to refresh your quiet time with God. There are two distinct approaches: Classic and Lectio Divina (see below for a description of this). Facebook users can also follow the readings with a daily Wordlive posting. Lectio Divina, also known as: Divine Reading or Deep Listening. 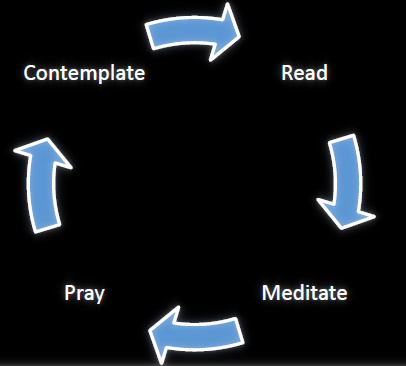 Read – Meditate – Pray – Contemplate. This ancient Christian tradition is a tool for developing a closer walk with Christ. It’s a method of Bible study designed to create lasting spiritual change in the lives of followers of Jesus Christ. This is achieved by breathing in God’s Word so that we focus on God’s words rather than our own. This is the goal we all should have when we read Scripture—to read Scripture not just for information but to experience personal transformation. Start by Reading the Bible slowly and reverently. Begin in stillness, just a few minutes as you prepare to hear God. Choose a small passage and read through it once. Then slow down and read through it again. The purpose of this reading is to let God speak to you through the Word about how you can be obedient to God’s will for your life. Then meditate on what you’ve read. To meditate simply means taking time to think about it. During this time ask, “What was Paul saying? What did Jesus mean? Why did David express it this way?” Sometimes you may want to read a commentary to help you understand the passage, but only briefly and only for clarity. The purpose of this type of reading is not to learn what others say about the text. The purpose is to allow God to speak to you directly. You want to hear God’s voice, not a commentator’s. So read slowly, carefully, then think about it. As you think about it ask: “What does it say? What does it mean? How does it fit into my life?” Meditate on the passage of Scripture, mull it over, ask questions, and consider all the possible meanings. Now talk with God about the Scripture. This talk, this prayer is a conversation, not a monologue. Many of us, when we pray, do all the talking, now we also need to spend some time listening. The amazing thing is that if you’ll listen, God will speak to you. People who say, “I’ve never heard God speak to me,” probably haven’t invested a great deal of time in listening. You probably won’t hear an audible voice; yet when God speaks, it can be much louder than an audible voice. As you meditate, God the Holy Spirit quickens your spirit in such a way that you know beyond a shadow of a doubt that God is speaking to you. In Lectio Divina, there is time spent in prayer in which you just listen to God—“God, what are you saying to me today?”—and you wait for God the Holy Spirit to show you, through the Word, what God desires you to know. This is also a time when you pour your heart out to God, asking God for strength, guidance, and direction. There’s no point in making promises to God that you don’t yet have the strength to keep. If God is challenging you to do something that seems impossible, talk it over. The more you pray about it, the more power and direction God can pour into your life. Finally, contemplate how to put God’s Word into action. Initially, contemplation and meditation seem like synonyms, but there is a distinction between the two. Contemplation is the process of nailing down how to put God’s Word into action, it’s the ‘so what’ part of the process. ‘So what’ difference does this make to my life. As you prayerfully read the Scripture, you discover biblical truths, principles, warnings, and commands. The goal is to define what specific thing God wants you to do to put these truths to work in your life. This is what it’s all leading up to—that we will become “doers of the word, and not merely hearers who delude themselves” (James 1:22). That’s the contemplation step of this process. You nail down what God wants you to do. To enhance this process you might like to journal each step. I find this especially helpful as I listen in prayer to what God is saying and as I contemplate what this means for me now. This also gives something to look back on in the days and weeks that follow.